Lenses. Different shapes and sizes, with different costs and prices. To someone just getting into wedding videography, the sheer amount of lenses available can seem quite daunting. To a pro, choosing the lenses you wish to use for your different shots is a topic worth discussing. The following is a brief introduction to the different types of lenses that are available, and the possible uses for each one. You’ll learn a about the prices you can expect to pay, and the type of shots you can use each one for at the end of the day. As you progress further through your journey of cinematography, you’ll become familiar with more and more lenses and the use cases for each one. Your familiarity with the different lenses will allow you to use them selectively to capture the exact shot you see in your mind. But of course, this all comes through practice! The 35mm is a wide-angle lens. It is great for capturing the entire feel of the wedding day. With this lens, you can easily get the ambience and energy of the room (or outdoor location) as true to the real image as possible. Since it is a small lens, you can be discreet with it and capture intimate moments as authentically as possible. The guests will not feel intimidated by or feel conscious of a camera capturing their emotions. It is the ideal lens for shooting the wedding ceremony, the exchanging of the rings and vows and even the people in the crowd. The lens is also unobtrusive enough to shoot exciting events, like the reception party afterwards. You can navigate the venue without fear of your shots shaking because you got hustled by the crowd. 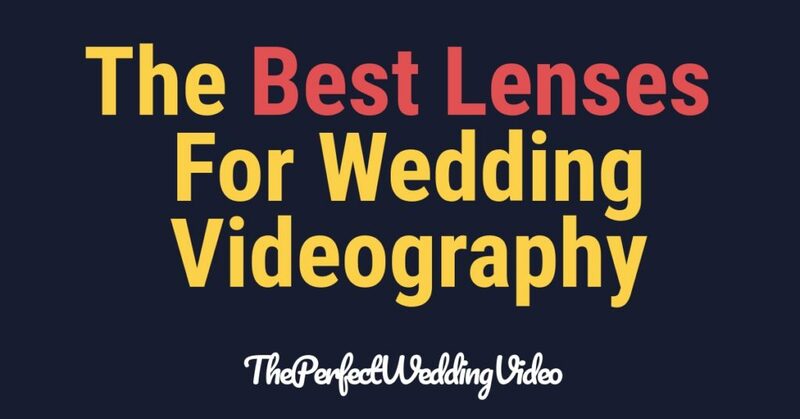 It’s a reliable lens to capture great footage and general shots of the wedding ceremony. Its wide nature allows you to capture a lot at once. Canon 35mm: This lens is great for photographing subjects in their natural environment while producing an image almost as close to how the human eye sees it. The wide f/1.4 maximum aperture allows you to get great shots even when the ambient light is poor. This lens is available for £1,649.00. Zeiss 35mm: The Zeiss is also an option you can consider for similar reasons to the Canon. It is compact and unobtrusive so you can shoot long sequences even at a crowded venue. The lens is also compatible with several different cameras. The lens is available for £849.00. The 50mm lens is suitable, regardless of whether you want to record videos or capture stills. The lens is not as wide as the 35mm, but this is only a plus if you are shooting in a small venue or in confined spaces, like a hotel room or a crowded banquet hall. While the 35mm is great for capturing the whole wedding party, including the parents, guests, the bridal trousseau, etc., the 50mm allows you to focus more on the couple. This lens provides a lot of room for capturing details. You can zoom into the centrepieces, the table tops, flower arrangements, the toasts, the wedding cake and a lot more. This is the lens you need to get all the details right, which will add to the montage of shots you will need to recreate the whole mood of the wedding party in the final video. If you only have the option of using one prime lens, the 50mm is the one you should go for. You can play around with the depth of field and make all your shots look stunning (perhaps even better than what it looked like in real life). Canon EF 50mm: This lens is great to focus on people. You can blur the background behind your subject and make them stand out like royalty. The lens utilises Canon’s characteristic STM (Stepper Motor) technology, whose near-silent quality allows you to capture great videos while focusing fast and smoothly. The lens is available for £124.95. Nikon AF-S NIKKOR 50mm: Experiment with bokeh and get great results with this lens. The fast f/1.8 aperture gives you sharp shots even in low light. It is great for those using entry-level DSLRs without a built-in autofocus motor. The lens is available for £209.00. The 85mm lens is a great lens if you want to shoot portraits. But other than that, you can get spectacular footage of the wedding party, of people dancing, etc., even from a distance. Worked at from a distance, you can get wonderful, cinematic shots of the couple. The lens blurs the background out, as opposed to the 35mm, giving you a clear, sharp image of the couple or the subject in concern. Even if the venue does not have great light for photo and videography, the 85mm can do wonders. The only possible downside is that the lens is heavy and if you are covering a high energy event with lots of things happening (as is likely to happen at a wedding), you may get tired of carrying the lens around. It is best used if you have gained some experience with cameras and long shoots. Pentax 16-85mm: The lens is durable and weather-resistant, allowing you to shoot in all circumstances. Great for outdoor wedding shoots. If the couple that hired you has an adventurous, destination wedding, this is a great lens to shoot with. The smooth autofocus allows you to get great, sharp footage. The lens is available for £449.10. Sony 85mm: This is a high-quality prime lens for shooting portraits. Its dust and moisture-resistant design also make it suitable for shooting in any weather condition and location. The double linear motor system allows quiet, fast and precise autofocus. This lens is available for £589.47. This is a great lens to shoot the wedding ceremony. You can get a steady shot standing right at the back, unobstructed by the crowd. Standing at that distance, you can get close up shots of the ring ceremony and then quickly zoom out and capture the rest of the party too. It is, however, best to carry a tripod as a long-range lens means there is a greater chance of the image shaking. Though every wedding videographer will recommend this lens, if you must pick any one, the 50mm prime lens should be your first option. Tamron 70-200mm: This lens has a fast autofocus speed, an enhanced vibration compensation and a great optical performance. It provides a five-stop handling advantage, giving you a sharp image up to five shutter speeds lower. The lens is available for £1,289.00. Sigma 70-200mm: This is a high quality, f2.8 tele-zoom lens that offers a constant aperture. Its optical stabilisation allows you to use shutter speeds four stops lower than you normally could. This lens is available for £780.00. Wedding videography can be a challenging profession to go into. But nothing is too hard if you have the right lens and know how to use it. The lenses mentioned above are some of the best in the business. Based on your level of expertise and skill, plus budget, go ahead and make an informed choice. The Perfect Wedding Video is currently covering London, with many other area’s coming soon as we build out our team so stay tuned!